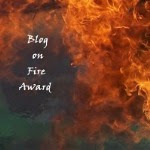 Last week I asked a question that touched a nerve with a lot of my readers. Many of you sent emails and left comments lamenting the way society erodes your daughters' self-confidence and remembering the painful erosion process as you experienced it. I don't claim to have any magical solutions or silver bullets. All I have are a few tools. Today I'm going to talk about those tools and how I use them in my ongoing war against the ravaging effects of adolescence and society upon female self-esteem. The first one is easy. And it's the mirror image opposite of something many of you mentioned. 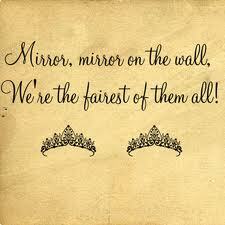 In fact, it even involves mirrors. From the time my daughter was tiny I made a point to say nothing but wonderful things about the way I look. It might sound egotistical or amusing to the casual listener who overhears me in a dressing room saying things like, "Wow, I look amazing in this swimsuit. Don't you think Mommy looks great?" I don't care what the casual listener thinks of me. It's much more important to me that my daughter hears me accept and rejoice in what I see in the mirror. That's not to say there aren't things I don't like about my refection. But, as so many of you commented, if I focus on those things then I am giving an open invitation to my daughter to turn her own critical eye on herself. In much the same way I make sure my kids see me reading, because I want them to know reading makes me happy, I make sure to verbalize, often and loudly, that I am content with what I see in the mirror. The second thing is a girl's program I recently discovered. Even though this particular program is based in Oregon, my guess is, something similar exists in many communities. Girls on the Run dishes up a mix of girl self-esteem building with good old fashioned running. It's an after-school activity that combines circle time with sessions of training that culminate in a 5K run. In the circle time the girls are led in discussions of various topics that include, but are not limited to, positive body image, personal goals, implementation of positive attitudes and healthy outlooks about eating. During the running time they are asked to implement their circle time discussion by doing things like making positive statements about themselves each time they complete a lap. It's an incredible program and even though we didn't hear about it in time to sign up this year. It's already on our list for next spring. The final tool is something else many of you mentioned in your comments on Friday's post. I make a point to have regular one-on-one time with my daughter. Sometimes we talk about things she deems "gross". Sometimes we're just silly. In the end, I don't think it matters what we talk about as long as she knows whatever it is, I'll be here to listen and help her find her way. Yes! These are wonderful because think about how different beautify is at different times in society. Stephenie Meyer said that she dealt with some of her own body issues when she wrote the book "The Host". Our bodies are such wonderful things and capable of so much, yet society teaches us to hate them. And I'm guilty of being sucked in. Sounds like you figured out some great tools to help your daughter navigate through it all with as much confidence and self-esteem as possible. Great. My girlfriends and I used to do something similar on our own. We'd stay after school some days to work out together. Sit and chat, then sweat. Girls on the Run sounds fantastic! A child's self image is so fragile and they do imitate what they see and hear. What you are doing for your daughters is priceless. I love your idea about the fitting room! It would sound funny if I was in the room next to you, LOL, but I think it's such a fantastic thing to do for your daughter. You are a wonderful example for your daughters! I'm thinking this is the best thing in the world that you're doing. Kudos! I love this! I have boys, but I do mentor teenage girls and I think it's way important, esp. for them to be confident in themselves and seeing me be confident in myself too. Angela, yay, I'm so glad I inspired you! Donna, exactly! All kinds of beauty. Carol, thanks I think it's so important too. Jemi, that's so cool. I hope they can put some of the ideas to use. Cassie, I bet you are an incredible teenage girl mentor! What a really insightful post. Your daughter should be very proud of you and I am sure she is a better person for having those simple kind of lessons. 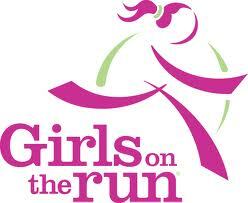 My daughter is enrolled at Girls on the Run and she loves it! It's actually a national program, and it is really popular in the midwest and east coast. Powerful post! Such important lessons you are instilling in your daughter. You are providing her a great foundation for her future. I wish all little girls had mothers who taught them not to fear being themselves! We, women, need to step up by example and word to encourage young girls to find and be their best selves without losing who they are in the process. In my city they've started a girl camp for just this type of self-esteem building. I think it's so great. And I agree, our daughters need to see us accepting and appreciative of ourselves... I just love that right now my 5 year old loves being a girl... she just loves it, and I encourage it. You've got a great plan going there. I admire your mirror plan and love the running bit. That last part is the one I try so hard to do--I am as honest as possible and will talk about anything. There are people sort of shocked with my level of sharing, who believe kids need censored information, but I think if I censor, i can't really expect to HEAR the full story when it is time they ought to tell it. It sounds like you are doing so many things right, Johanna. It is such a big part of of it--teaching our children to like themselves. And giving them a sound and secure anchor at home. 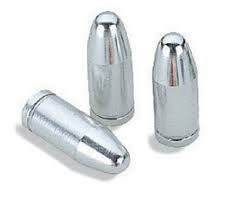 As far as not having any silver bullets? Children still don't come with owner's manuals. Until that time, all we can do is the absolute best we can do, and love them and love them and love them--so much that they can't miss the fact that they are loved.